International departure taxes of $143 plus current fuel surcharges of $350 are included (subject to change). Today our pilgrimage begins! We depart New York or Chicago for France, on our transatlantic flight, aboard a wide-bodied jet. We enjoy in-flight movies, dinner and breakfast aloft. This afternoon we arrive in Lourdes. After checking into our hotel, walking distance from the grotto, we enjoy free time to acclimate to the time change. In the early evening, we join the Rosary and candlelight procession. Overnight and dinner at our hotel in Lourdes. Today is a leisurely day in the special town of Lourdes. We celebrate Mass at the grotto, the very place where the Virgin appeared to Bernadette. We enjoy an orientation visit to the Shrine and a walking tour. We visit Boly Mill, where St. Bernadette was born, the Cachot, her simple house where she lived during the apparitions, and the parish church. We enjoy the opportunity to experience the healing waters of the miraculous Lourdes spring, then walk the stations of the cross. In the early evening, we join the Rosary and candlelight procession. Overnight and dinner at our hotel in Lourdes. This morning, after breakfast, we journey north to Paray le Monial, known as the City of the Eucharist, and visit the site of the Shrine of the Sacred Heart of Jesus and Saint Margaret Mary Alacoque. Here we stop in the Chapel of the Visitation where she famously received the visions of the Sacred Heart. Dinner and overnight at our hotel in this region. Today we visit the convent of St. Gildard, where Bernadette Soubirous of Lourdes spent the final 13 years of her life. Here we see her incorrupt body kept in a glass reliquary. We enjoy a guided tour of Nevers before continuing to Paris. As we drive into the Illuminated City, our first stop is Sacré Coeur, located at the summit of Montmartre, the highest point in Paris. The spectacular view of the city will take our breath away. We then tour her sights passing the Eiffel Tower, the Arc de Triomphe and travel down the famous Champs-Elysees. Dinner and overnight at our hotel in Paris. Today pilgrims have the option of a free day in Paris or if there is enough interest, an optional day trip will be offered to Pontmain, Our Lady of Pontmain, also know as Our Lady of Hope is the title give to the Virgin Mary on her apparition at Pontmain, France on 17 January 1871. Dinner and overnight at our hotel in Paris. After breakfast, we will head into French-speaking Belgium, for the final leg of our pilgrimage. Our quest is to see two of the only four Vatican recognized 20th century Marian apparitions in the world. First, we stop in Beauraing, where the Blessed Virgin appeared 33 times starting in 1932 as the “Virgin of the Golden Heart” to 5 children aged 9 to 15. The Mother of God called for prayer for the conversion of sinners. We continue to Banneaux, where “Our Lady of the Poor” is the sobriquet given to the apparition of the Virgin Mary to 11-year old Mariette Beco in a garden behind the family’s cottage. The Virgin Mary here promised to intercede for the poor, the sick and the suffering. 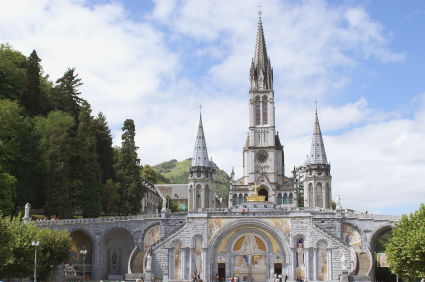 We visit the sacred spring, the Chapel of the Apparitions, and celebrate Mass. We celebrate our pilgrimage with wine at our final dinner. Overnight at our hotel. This morning we will visit St. Michael and St. Gudula Cathedral, in Brussels, the capital of Belgium. This is the site of a verified Eucharistic Miracle in 1370. The Cathedral contains artistic testimonies in the form of stained glass that tell the story. We will celebrate our final Mass here as we conclude our extraordinary pilgrimage. Time permitting, we will enjoy a short driving tour of Brussels as we head to the airport and board our flight back to the U.S. via Paris arriving later today. The memories of our spectacular pilgrimage will stay with us forever.